Whenever installing a drop ceiling in a basement there are always a few areas where there seems to be questions on what to do. The bottom of the stairs is one of those areas. 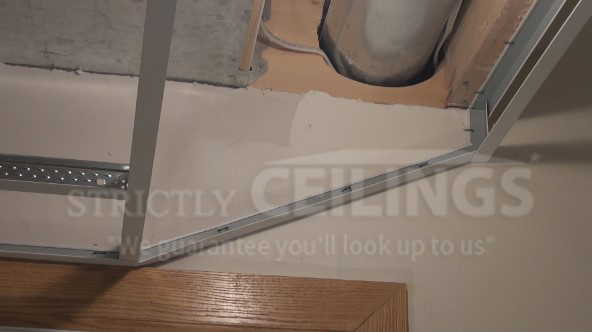 Typically headroom is a major concern when installing a false ceiling in a basement and that can be more of a concern when coming down the stairs. 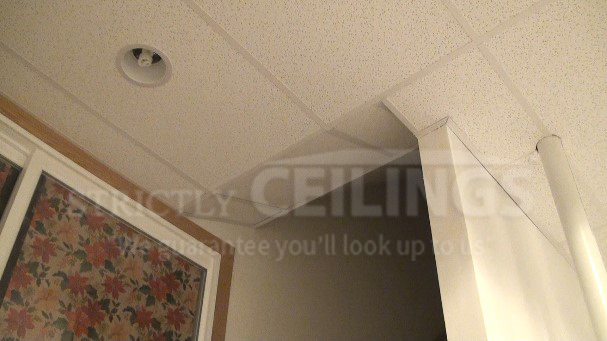 There are several things that you can do to increase ceiling headroom as you are walking down the stairs and into the basement. You could either build a drywall bulkhead that protrudes out into the room and drops down to the ceiling height or you can build a stairwell slope out of the drop ceiling material. 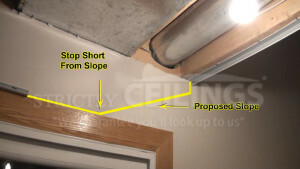 Let’s take a look at how to construct a drop ceiling stairwell slope. In most cases the layout of the ceiling grid is already determined before the slope is built so you begin by visualizing how the slope will look. Pre-planning is the best thing. Determine how much headroom clearance you need. Determine how far back into the room the slope will begin in order to achieve the proper head clearance. Use pieces of the ceiling grid and have someone walk up and down the stairs to verify clearance and design. In most cases a typical stairwell slope will be between 6” to 16” in length and have a vertical drop at the start of about 2”- 4”. It’s important to visualize the slope and then place marks on the walls to give you an idea of where the slope will begin. Try to start the slope on a tee line, this will keep it looking more natural. When building a stairwell slope the wall angle for the slope is typically left off until all of the main portion of the ceiling work is completed. The reason for this is because you don’t know where the slope will begin its rise. After you have visualized what the slope may look like and determined its point of rise, cut and install the wall angle to fit on the wall and secure it. It’s ok if you can’t install all of the wall angle. Sometimes it’s better to leave it off until you get to that area. Begin by finishing the level ceiling grid as far as you can. Once the ceiling grid is installed up to the slope you need to make custom sloped cross tees to fit the angle of the slope. Measure and cut the cross tees to fit the angle and pop rivet them into place. Make sure they are square to the ceiling grid behind it by using a speed square. If a main runner extends into the slope, you can use that as one of your slope tees. If you have a vertical drop at the top of the slope then cut and install the tees making sure that they are in-line with the sloped tees. This is an important visual part of constructing the stairwell slope as it will be the first thing that people see when coming down the stairs. 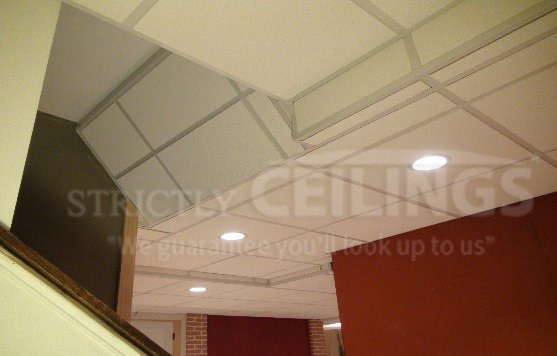 When installing ceiling tile into the slope of the grid there are couple of important things to remember. Always install the vertical tile at the top of the slope first and then install the slope tiles next. Install hold down clips on the back of the sloped tiles to prevent up lift. If you have a vertical drop before the slope make sure there are hold down clips on those tiles as well. At the beginning of the slope make sure to back-cut the tile so it sits flat in the ceiling grid. Use caulk adhesive to hold stubborn tiles in place that cannot be clipped. Installing a stairwell slope can be time consuming and confusing but you can do it. 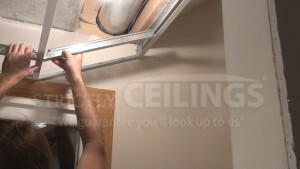 Watch the full video for step by step installation help on how to build a drop ceiling stairwell slope just like a professional.